During the past two hundred years, millions of emigrants streamed through Ellis Island, New York, to find a new life in America. V’Soskes arrived from Poland and made their way to Grand Rapids, Michegan. There were two brothers, Thadius, an engineer and Stanislaus, an artist. After exploring several different career prospects they noticed that there were good Government grants for manufacturing from wool. They studied how carpets were made, inspected every possible type of carpet in the shops and agreed they could make better ones. They combined their talents and developed hand tufting with an unique hand shuttle which gave their carpets original quality and design flexibility. In 1920 they set up a factory and soon the V’Soskes were a household name for magnificent carpets. It was a typical American success story. Thadius married Vesta a widow with seven sons, and soon the company with Vesta’s help grew in confidence and increasingly dominated the U.S. market. Vesta came to Europe in 1957 to establish a factory there. She couldn’t make up her mind whether to build in France or Germany. On her way home she stopped at Shannon and spent a holiday at Harry Hodgson’s Currareavagh Hotel, Oughterard. One evening at the bar she got talking to Jimmy Joyce and Burke Monaghan. The two Galway men were very impressed with Vesta. She was a colourful character, she wore large floral hats, enthused about the beautiful colours of Connemara and told them she was looking for a European base to establish V’Soske on this side of the Atlantic. The next day the men brought her to an old Kirk in Moycullen that Vesta thought was ideal. The deal was struck, V’Soske Joyce was established and renovations began on the Kirk. A local carpenter Michael Dixon was employed. When Vesta first approached Michael he refused. “ I had a store full of machinery belonging to Bowmaker, and I thought I would stick to joinery but Vesta felt I had a flair for design that I could turn my hand to anything and when I was offered the job a second time my wife encouraged me to take it.| I was brought into the business. “When Jimmy Joyce died his widow Alma Joyce Sugrue took over as Managing Director. Michael became factory foreman in 1959, was promoted to Production Manager in 1970, a Director in 1973 and Managing Director in 1979 on the retirement of Mrs. Joyce Sugrue. It has been an astonishing success ever since. In 1991 the year Michael Dixon retired the company was reputed to have a turn over in excess of 5 million. V’Soske Joyce Carpets are known throughout Europe and the Middle East. Their clients read a bit like the United Nations. They include practically all the Royal families, Harrods, Oman Airport, C.B.S. New York, San Francisco Golf Club, Ford Motor Co. London, B.P. London Headquarters at Finsbury Circus (20.000 sq. metres of luxurious carpet). The Sultan of Brunai, Rolls Royce, Riyadh International Stadium, Embassies all over the world, hotels such as the Dorchester, Grosvenor House, Royal Lancaster, Cavendish, Hiltons, the Crillon and Ritz of Paris, most of the main world banks including Solomons, Bank of America and the Chase Manhattan and of course the very grandiose private residences and yachts. The company count Paul McCartney of Beatle fame, Lady Charlie Chaplin in Zurich, Sheik Sindi of Saudi Arabia for his palace in Jedda, Prime minister of Sweden’s residence in Stockholm, 3 palaces of the late Shah of Persia, the Sultan of Oman (fondly referred to as H.M. his majesty) – a carpet of 6m of red carpet which was rolled out for visiting dignitaries. V’Soske carpeted H.M’s private residence in London and Paris. These are their clients to name but a few. Michael Dixon designed many of the original carpets that graced the hotels, embassies, offices and homes of their wealthy clients. 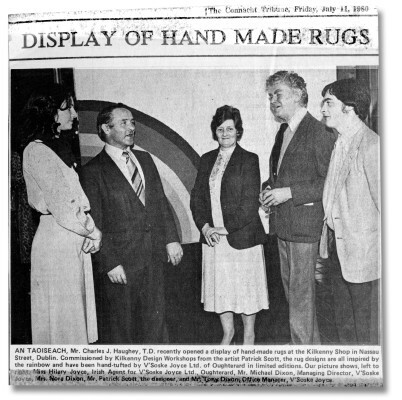 In the early 80’s John Gibbons a local artist was also involved in design and later on Eileen Dixon became involved in design.. All of these carpets were made at the Old Railway Station in Oughterard. 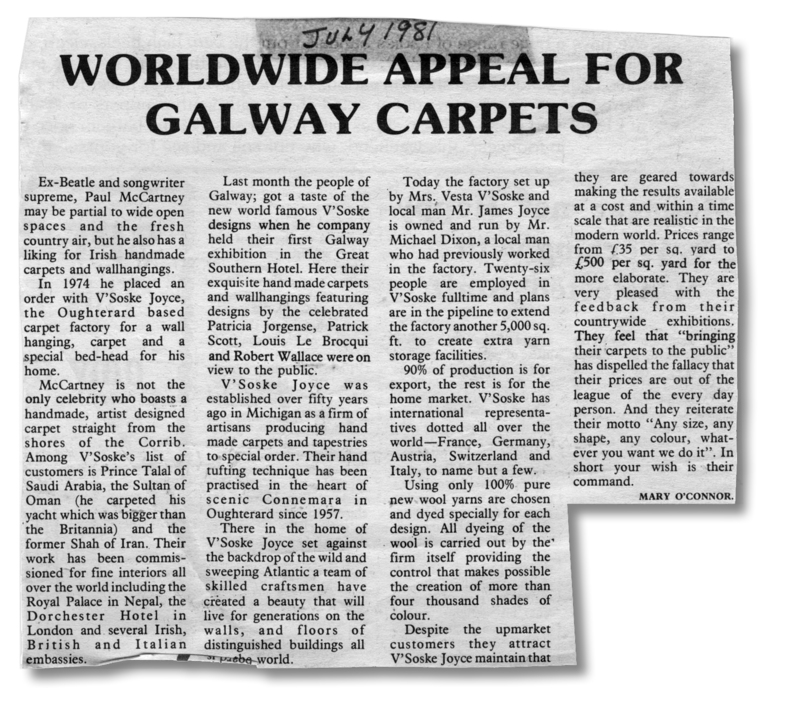 In Ireland V’Soske Joyce carpets can be seen in the ante-room in the Seanad, the board room of the Insurance Corporation of Ireland, the old P.M.P.A. head office, the Stephen’s Green Club, parts of the Shelbourne, The Gresham, The Westbury, The Berkeley Court Hotels and most recently the Government State Buildings and City Hall Belfast, Vincent O Brien, famous horse trainer, acquired a carpet for his dining room at Ballydoyle; and this list is by no means exhaustive. The magnificent wall hangings in Knappogue Castle, Co. Clare were made in Oughterard as were the wall hanging in the Bank of Ireland Oughterard and the surrounds to the Communion Railings in the Church of the Immaculate Conception, Oughterard. When the Taoiseach Garrett Fitzgerald visited Galway in 1984 he was presented with a rug bearing the Fitzgerald Coat of Arms. 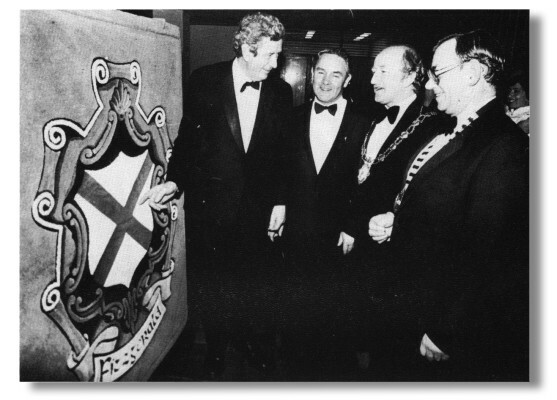 When ex- President Gerard Ford came to visit friends the Masons of Ballinahinch Castle Hotel, the company presented him an exquisite carpet. Multi millionaire friends of the former us president splashed out thousand of pounds in a 60 minute spending spree in the factory. The bill when totted up was reckoned to be worth £1000 a minute to the locals. Mr Ford(68) and his wife Betty saw the luxurious carpets being made by the 35 strong work-force at the time. 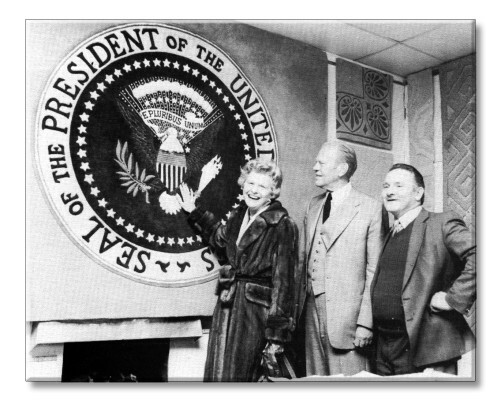 The big splash came after the Fords accompanied by oil tycoon and business associate Mr. Raymond Mason and his wife and friends, was presented with a specially made wall hanging carpet bearing the Presidential Seal and the Stars and Stripes against a background of blue. John Gibbons designed the carpet and it was based on a sketch supplied by Mr. Mason. So impressed were the group with the carpet that Mr. Darius Keating, a long time associate of Mr. Ford ordered five as gifts for other members of the group. The price tag was not too far from £50000. March 1984 when Mrs. Nancy Regan wife of US President Ronald Regan visited TrinityCollege, Dublin she was so taken with V’Soske Joyce carpet that she actually got down on the floor to examine the carpet. 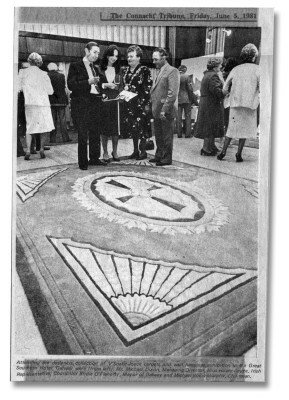 The Staff and pupils of St. Paul’s Secondary School on a school tour to Rome presented the late Pope John Paul with a rug with the crest of the school at a private audience. According to the Pope’s secretary, Fr Magee, the pope sent the rug not to the VaticanMuseum, as is the normal procedure with such gifts but to his own private residence. The company moved to Oughterard for more space around 1967. Yet the Old Railway Station is a totally unpretentious building. There wasn’t even a company sign or logo on the outside in the early days. The reason they hadn’t a sign was the building was a manufacturing base and wasn’t geared for visitors. In 1978 Michael Dixon then Production Director purchased the company. The Dixons now own the company which is still a family affair. Michael after his retirement remained on as chairman, Tony, his son, became Managing Director, Gerry became Production Director and Eileen Design Director. In 1991 they employed 32 people. What is so special about the carpets? They are hand-tufted in the traditional way using Thaddeus invention (later electrified), the carving process is unique, they are exclusive designs, they are made practically to any specification and their designers are mostly top class professionals. They have worked with Phillippe Stark, Ettore Sotsass, Patrick Scott, Patricia Jorgensen, Mary Fitzgerald, Louis Le Brocquet, Terry Dunne, Patricia Murphy and many more famous designers, who have not only commissioned works but helped to develop new techniques and create new textures along the way. Using only 100% pure new wool yarns are chosen and dyed specially for each design. All dyeing of the wool is carried out by the firm itself thus providing the control that makes possible the creation of more than 4,000 shades of colour. Their motto is, “ Any size, any shape, any colour, whatever you want we do it.” In short the customer’s wish is their command. It is the variety of yarn types and textures, combined with their skilled craftsmen that has enabled the company to be part of some of the finest art collections in the world. They have a number of in-house inventions developed by local man Tom Welby, that they are not keen for visitors or competitors to see. Tony was working at Hotel Management with Trust House Forte in London when his father invited him home in 1978 to have a look at the company. Vesta had offered him her shares and it didn’t take long for the Dixon family to accept the opportunity. How did such a small Company become a World Leader? Certainly V’Soske Joyce is very practical in its approach to the world market as an exclusive quality product. They produced a range of wall hangings and rugs designed by artists and exhibited in prestigious galleries in Brussels, Paris, London and Dublin. There seems to be no end to their creativity and marketing expertise. The carpets or wall hangings are not cheap. In order to reach a wider market of non-millionaires or big firms, they have a product called the Yeats Line, machine-made, hand carved, of good quality and design, but much cheaper than the hand-tufted. Again, it is a sales success. Over the years I have visited the factory. My own favourite carpet is the carpet made for the Sultan of Oman’s Yacht, larger than the “Britannia” and just smaller then the “Q.E.11”, It was made for his own personal throne room on this floating monument. The Sultan required the expertise of V’Soske Joyce to create the throne itself as the central motif in their carpet – and then had them do an identical second carpet as a replacement, in case the first was damaged! The bill in the 80’s for this whimsical little idea according to reliable information was in excess of £100,000. My favourite wall hanging is “The Fremantle Icon Tapestry”. When Desmond M. Kyne was commissioned by the Oblate Fathers of Australia to design a wall hanging to commemorate their centenary in 1984 he had a problem on his hands. Where in the world would he find a company to produce such a large work of art? The sheer size excluded any of the smaller craft workshops who could recreate his design but the larger companies would not be able to give him the hands on facility he required. After almost two years searching he was about to give up when he heard of V’Soske Joyce in Oughterard. During his first visit he was convinced that he had found what he was looking for, a company with the facilities to produce his design faithfully and he was allowed to work closely with the ‘tufters’ to realize his dream. Mr Kyne was one of the few iconographers in Europe with a wealth of experience. He was commissioned to design for such diverse locations as Knock Shrine and the White House. His designs are based on the icons of the church through the ages, from pagan times through Christianity and the unique mixture that is part of the Celtic legacy. The icons are not applicable to churches alone as they are suitable for the corporate and home market. The Tapestry measured some 50sq. metres and weighed almost one tonne. This had to be one of the biggest wall hangings ever produced. Because of the problems in hanging a wall hanging of this size Gerry Dixon was requested to go to Australia and supervise the hanging and also design the layout of gripper to be used. Of course Gerry was delighted to travel but it also goes to show the length the company went to satisfy their customer. The most expensive carpet the Company ever made was a pure silk copy of a Persian design commissioned by an American couple at £3,600 per sq. yard coming to a total of £44,000 for a small bedroom carpet. They also made carpets for the multi millionaires private 747 aircraft and his wife’s G4 plane. One of the most unusual orders the company received was for a huge carpet with 5inches high pile. The order was shrouded in secrecy. The client’s name or whereabouts was never disclosed. On completion the carpet was handed over in a London warehouse amid tight security. Proud Heritage Dixon ’s Carpets are considered not only an excellent investment or status symbol but a thing of beauty executed in wool – and it can be presumed to be a joy forever. They are fit for kings but Michael Dixon is emphatic that you don’t have to be a millionaire to own a V’Soske Joyce/Dixon carpet. At Oughterard where East meets west with a plethora of princes commissioning carpets full of the Galway equivalent of Oriental mystery and charm the Dixon family has a lot of people floored! We often accuse ourselves of being a nation of cynics, grudging in our praise. Surely V’Soske Joyce/Dixon Carpet Company situated in a small undistinguished building on the edge of Europe, here in our own village, producing work of superb craftsmanship and selling it throughout the world deserves our admiration and gratitude, It is truly a remarkable achievement. This page was added on 10/02/2012. hi I have 2 carpets made by vsoske one has a motto” in god is all our trust ” with 3 crests and is round and has a label made in sth Ireland by vsoske the other is18ft 13ft and made in usa with its label any help ?